All I can think about at the moment is any minute my mom is going to be wheeled into the operating room in Billings, Montana while I wait helplessly here in Florida. She’s having emergency open-heart surgery to correct a blocked artery. It scares the crap out of me that I have no control of what hospital she is in, if it’s a good one, if the doctor is good or even if she has a choice. I have to wait. And pray. And plead to God to not take my mom away from me today. We had a rough childhood. She and my dad divorced while I was young, and my dad took us kids and sent my mom away. Back in the 60’s and 70’s things like that were done with the wink of an eye and the handshake of a judge. I didn’t see my mom again until I had had my first daughter. Amber was six months old and I received a telegram with information on it to call my mom. From that moment on we’ve been inseparable. We call each other constantly, visit as often as we can and are totally a part of each other’s life. Now, my mom’s life is held in the hands of a surgeon I know nothing about. I have to have faith in God that he will guide the surgeon and give him the skills necessary to have a successful outcome. I love my mom. She’s my number one fan and I’m her number one daughter. I’ll pray for her with all my might and power. My first beloved - My Mom. My mom made it through the surgery but then her pressure dropped and the surgeon had to go back and basically do the entire bypass over again to figure out why her pressure dropped so low. She is in ICU in critical condition. The surgeon had a nurse stay with her all night to monitor her. I’m waiting on word from my sisters who are with her in Montana while I wait and freak out here in Florida. I am sending a prayer that way right now! Came over from the 5 Minute Friday Blog Hop. Praying from Alabama. 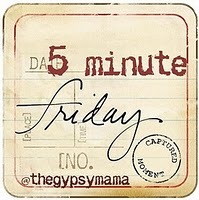 I hopped in to visit from Five Minute Friday...didn't know why....then read your post and knew. I felt that way about my mom too and lived many miles away for a while. My parents lived with my husband and I the last five years of their lives and I would not take anything for that. Thank you for your prayers. I appreciate them so much. We are all praying with you rpthat everything gies well and that your mom would be up and about in no time! I am so glad and gratful that you two connected again after so many years and that your lovefro one another runs deep! Visiting from SITS. I am praying as well for your mom's recovery and sorry she had to go through that surgery twice. Thank you all for your prayers. I'm so grateful for your kind words. My mom is off intubation and is on oxygen but still not completely awake yet. She is in a lot of pain and the meds keep her asleep a lot of the time. She's still in ICU. My youngest sister is with her. I'd be on the next flight out, however, I'm having surgery on 2/20, this Wednesday. Really bad timing on my part, but I never dreamed when I made the surgical appt anything like this would happen. If it were elective surgery I'd be able to reschedule, but it's not. My mom is a fighter and she will get through this with God's grace and mercy. I know this. And, I will visit her in June for her birthday.